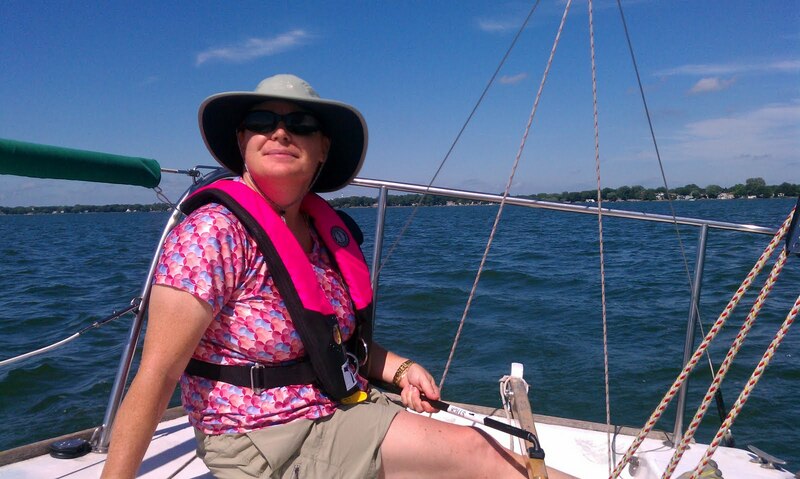 Saturday, the 9th was our second attempt at testing-out for our ASA 101 certification and Jane made it. All the trips back and forth to Madison have paid off. Her certification means she's rated to take out J24s on her own (well, technically with at least one other person to crew for her--that would be yours truly). For a highly coveted Hoofer boat, we were lucky to find an open spot the very next Monday (yesterday) afternoon and so we grabbed it. Finally, a chance to sail on our own, a micro taste of things to come. Jane made sure it was all the more memorable by packing snacks (hard-boiled eggs and cashews...yum) and our ipod and dock. The weather did us the favor of being perfect: sunny and hot with just enough of a breeze to keep us moving. Of our three hour slot, the first hour went to getting the boat ready to sail. There's a lot more to do when there're only two to do it and nothing is automatic yet. Jane helmed and I crewed. (After a rather humiliating test-out, I've decided to take a short break from helming, lest I develop an aversion to the whole idea.) This meant that while mon capitain sailed on in stately grace I ran all over the boat: trimming the jib, fixing the tell-tales, preparing refreshments, dj-ing, etc. Not that I'm complaining; it was a perfect afternoon and provided an all-too-overdue reminder of why we decided to do this sailing thing in the first place. 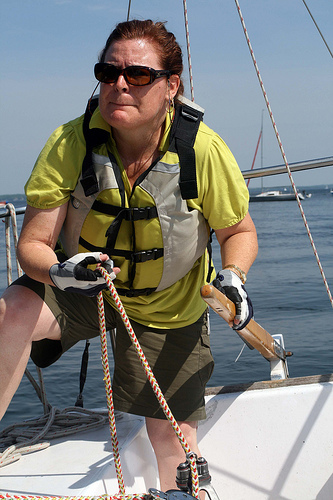 We agree that all it's all worth it, everything we've done to teach ourselves to sail, given where we plan to sail, but most of the people who belong to Hoofers, we think, never sail much beyond Lake Mendota. Lake Mendota is a lovely lake, not large by any means, and not one, as far as we know, that offers interesting places to sail to. In other words, one essentially sails around in circles for a while and then moors the boat and goes home. Although, I suspect what Hoofer members mostly do is race--not an interest of ours. This has confirmed our suspicion that for us, sailing in the final analysis is a mode of transportation. Sailing is as much about leaving from point A to arrive at point B as it is about the time in between. It is the worldful of points A and B and the leaving from and arriving at them as much as it is being on the sea that enthralls us. So, for the very near future, we--including me at some point--will till around "Hoofer's" lake just for the practice of keeping the wind in our sails and the joy of being in the water with the sun on our faces yet counting the days until the real adventure begins.